Nelson Cruz, 38, signed a one-year deal with the Twins. In the midst of the 1994-95 baseball strike, 38 players received surprising news: They had been granted free agency. They were a new type of free agent — a restricted free agent. Players with at least four years of service time in the major leagues but fewer than six — which is still required to become a free agent today — could field offers on the market. Their previous teams could match any offer they received, much like teams do in the NBA or NFL. As Major League Baseball remained engaged in a bitter labor dispute that wiped out the World Series, owners had declared an impasse and implemented the restricted free agency plan, along with a salary cap, to replace salary arbitration. The Boston Red Sox even reached verbal agreements with restricted free agents Sammy Sosa and Kevin Appier before the MLB players association filed a complaint with the National Labor Relations Board and the owners’ new system was scrapped. MLB has not had a work stoppage since 1994-95, its longest stretch of labor peace in the free-agency era. But because free agency seems broken for many players, and accusations of collusion are being levied, there’s growing speculation that labor strife could await when the collective bargaining agreement expires after the 2021 season. To save free agency, it turns out that players could actually benefit from what the owners proposed nearly a quarter-century ago. What players need is a pathway to the marketplace nearer their prime seasons. The MLBPA’s biggest problem with the current free-agency structure is that to become a free agent, a player must accumulate six full years of service time, which players typically reach after age 30. The average age of a free agent signed so far this winter was 32.2 years, according to data compiled by The Baseball Cube.1 Since the 2013-14 offseason, the average signing age has hovered around 33 years. That’s well past a player’s prime. Position players generally peak between age 26 and 28. Pitchers peak even earlier. Those years are almost always controlled by the club at below-market wages, unless a player debuts at an extremely young age like Bryce Harper (who was 19) and Manny Machado (20) — unusually young free agents who are entering their age-26 seasons. The other issue for players and free agency is that the game is becoming younger. The average age of position players last season (28.1 years) was the youngest since 1979. That age has gradually declined from a peak of 29.3 years in 2004. The average age of pitchers has also declined from a free-agency-era peak of 29.2 years in 2005 to 28.4 last season, tied for the third-youngest this century. Yet the average debut age for hitters and pitchers has remained static. The average debut age last season was 24.3 years for hitters and 24.6 for pitchers. 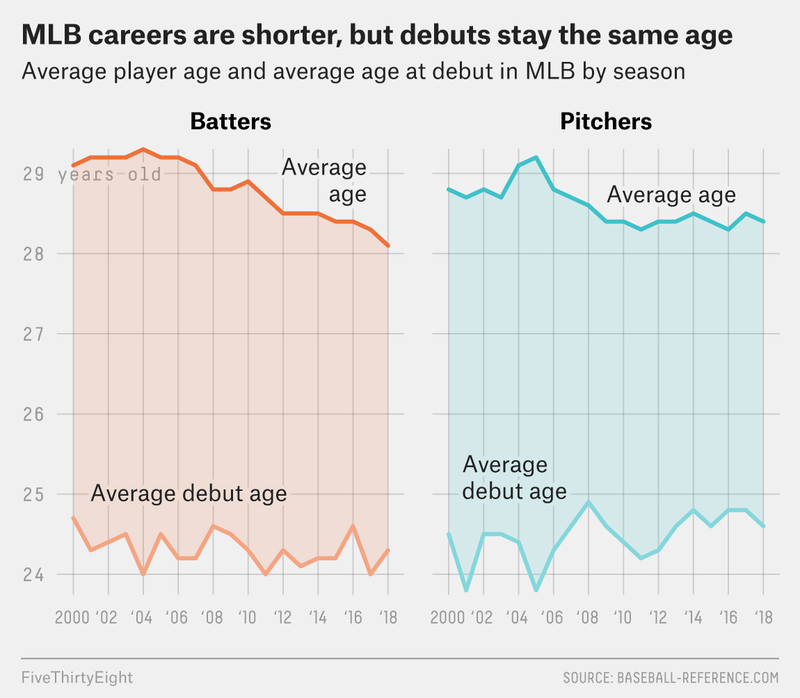 For hitters, the average debut age has ranged between 24.0 and 24.6 years since 2000, and for pitchers, it’s ranged between 23.8 and 24.9 years. What it all means is that hundreds of age 30-plus seasons have gone missing from baseball. In 2004, there were 250 players age 32 or older who recorded at least 100 plate appearances or faced 100 batters on the mound. Last season? There were 190 such players. There have only been four seasons — 1915, 1917, 1965 and 1975 — in which age 32 and older position players accounted for a lesser share of wins above replacement than last season, at 12.9 percent. The fifth-lowest share was 2017’s 13.1 percent. This youth movement is likely tied to performance-enhancing drug testing that began to be attached with penalties in 2004 as PEDs were thought to extend careers. But teams have also never had more data to understand how players age. Clubs seem increasingly unwilling to spend on 30-something free agents. And while the back end of careers are being squeezed, clubs are often accused of manipulating the service time of players, particularly elite-level prospects, on the front end of their careers to push down wages in prime earning years and gain more controllable years over players. While this offseason has warmed after an even colder start than the previous winter, the 2017-18 class was considered to be a weak crop of free agents. This year’s class was long considered elite, with some forecasting that the total contract amount would set a record, with $3 billion or more guaranteed to players. But the total dollars guaranteed through Feb. 5 — or 100 days after the World Series — hit just $1,066.78 million, which fell well short of the totals through the same point in recent offseasons, excluding the winter of 2017-18. And it’s not just total dollars that are off those of the not-so-distant past, but also the annual average value of contracts. Our pool of available free agents includes any player with major league experience who was granted free agency or released in October and November of each season. That excludes players signed internationally or those waived by a club before the season ended or later in the offseason. FanGraphs forecasts that payrolls could decline for the second straight year this season, while revenues grow and values of franchises soar. Moreover, the percentage of one-year deals signed has spiked. Of the 80 free-agent deals signed through Feb. 5 this offseason, 51 — or 63.8 percent — were of the one-year variety. That’s the greatest one-year contract share since at least the 2013-14 offseason, perhaps suggestive of players lessening their contract expectations. So how would restricted free agency help beyond getting players to the market earlier? It should also increase their share of revenue. Players with more than three years of service time but less than six are eligible for arbitration. The first year of arbitration eligibility is supposed to garner a player about 40 percent of their open-market value, the second year 60 percent, and the third year of arbitration approximately 80 percent, though that estimate does not always apply. While arbitration earnings are far greater than pre-arbitration salaries, which are typically near the minimum salary, they are still short of market value. The type of restricted free-agency system that owners attempted to implement in 1994 seems increasingly beneficial to players today. That system could have made young star Francisco Lindor a 25-year-old free agent this winter and Mookie Betts a 25-year-old free agent last winter. While clubs would likely fight today against something they proposed a quarter-century ago, free agency isn’t working as intended for many players. The union might need to be more creative and dig in for change. “As we approach the next round of collective bargaining, we’re going to be considering all aspects of the system, as we always do,” an MLBPA spokesperson told FiveThirtyEight in November. And perhaps that should include an examination of an idea that originated from the other side. We used the player’s age as of the start of the season.